Everything you need to know to buy or adopt a Coonhound puppy or adult dog. Is a Coonhound the right breed for you? The most common coonhound breeds are the American Leopard Hound, Black and Tan Coonhound, Redbone Coonhound, Bluetick Coonhound, Treeing Walker Coonhound, English Coonhound, and Plott Hound. Each coonhound breed has a somewhat different style of hunting and a dedicated fan base eager to extol the virtues of their favorite breed. But my focus is on these dogs more as family companions. In that role, they are much the same as each other. Are YOU right for a Coonhound? Should you get a male or female Coonhound? What age should your new Coonhound be? Where can you buy or adopt a Coonhound? For obvious reasons, Coonhounds are common in rural (hunting) areas of the United States, but not in cities. 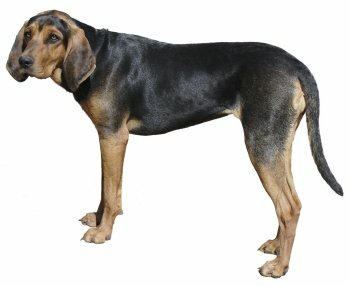 Coonhounds (and Coonhound crosses and mixes) are often available from Dog Rescue groups. Coonhounds may be turned over to Rescue because the owner found out they needed too much exercise. These are hunting dogs. If you try to shoe-horn them into a sedentary lifestyle, you can expect an unhappy Coonhound with a perfect right to vent his frustrations through rambunctiousness and destructive chewing. Coonhounds can be found here, although shelter personnel may mislabel any small hound as a beagle, and any medium to large hound as a foxhound or coonhound. You can buy a Coonhound from a show breeder, who breeds Coonhounds to match a detailed standard of appearance for the dog show ring. Or you can buy a Coonhound from a performance breeder, who emphasizes an energetic temperament and strong "prey (chasing) drives" for hunting. Some breeders are a combination of show/performance, though how they prioritize those two goals can vary greatly. You might also be able to buy a Coonhound from people who "just breed pets" or "just had one litter." But should you? Be sure to read the article to learn more about these people. If a seller can't show you those certificates, the puppies are higher risk for health problems. You might choose to accept that risk. But then you need to be willing (and able) to pay a couple thousand bucks for future surgeries and lifelong meds if your Coonhound ends up crippled from hip dysplasia. In rural areas, a Coonhound might occasionally show up in a pet shop. I have plenty to say about buying a puppy from a pet shop! How to test the temperament and personality of Coonhound puppies and pick the best puppy in a litter. Should you consider buying only AKC registered Coonhound puppies? Do AKC papers and pedigrees really matter?